Thesis: Powerful and gripping it may be, but ultimately Cidade de Deus is a film of despair, offering a one-dimensional view of urban culture in a Brazil where social divisions appear too wide to bridge, and where millions are too brutalized by violence and poverty to contribute to any process of change. 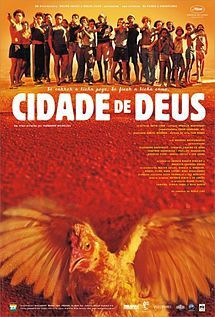 City of God (Cidade de Deus) is a brilliant piece of film making. The reality with which brutality and violence is presented to the audience alongside the circumstances of their happening is of highest artistic merit. Yet, in spite of all its cinematic accomplishments, the movie’s utility as an agent of social change is very limited indeed. It is this assertion that would serve as the thesis for this paper. The authenticity for the film and its narrative comes from the fact that it was based on a real shanty town in a corner of Rio de Janeiro. It captures the lives of its inhabitants across three generations in one of the most dangerous places that the civilized world had seen. Consistent with its gangster theme, the movie depicts “rise and fall of petty empires, the brief supernova of gangster superstardom, the overturning of an older order by a yet meaner, more ruthless younger one; these events are lit up, here and there, by little spurts of recognizable behaviour, even love”. In other words, it is a movie targeted to a young male audience. In doing so, the movie loses its appeal to a larger audience, thereby reducing a widespread social impact that is expected of all social documentaries (fictitious, re-enacted or conjured) (Corliss, 2003). That is not so say that the movie is an endorsement of nihilism. Beneath the surface of violence and distress is the finer expression of tragedy, which anchors disparate parts of the narrative. City of God is not just another run-of-mill gangster movie. The gangsters of Rio de Janeiro are unique. The director pays attention to detail in showing the idiosyncrasies of these gangsters. The portrayal of these youngsters comes across as genuine. For example they are shown to be “scruffy, dirty, scampering around on the dusty play-fields and squalid alleys, their body language expressing the weightlessness of their thin bones and scrawny chests, their clothes just any old rags, their feet bare or sporting flip-flops” (Corliss, 2003). This description will suit the young inhabitants of any urban slum, but what sets the youngsters of City of God apart is the fact that they carry guns. In a society where force is the only way of life and where “might is right”, a gun acts as a symbol of social status. The more sophisticated the machine, the more fear and awe that it elicits from the society (Corliss, 2003). The central character in the movie is that of Alexandre Rodrigues, who plays the role of “Rocket”, someone who does not fit into the gangster setup as he explores possible options for livelihood. The word “livelihood” may seem irrelevant to the lives of teenagers in civil societies but not quite in the City of God. The narrative essentially revolves around how Rocket grows up in the hostile environment of his slum and how he finally manages to break away (if only superficially) from the volatile conditions to a more organized one in the form of a professional photographer. Rocket might be the central character in the film, but to call him the protagonist would be inappropriate. In fact, the different contexts of his life were the real focal points of the story. Right from his early days with his brother (who was part of the notorious Tender Trio) to his acquaintance with the diabolical Li’l Dice, Rocket’s life is full of uncertainties and risks. Once again, while the film invokes disgust and outrage as a result of the inhuman behaviour of its characters, it fails to propose an alternative way of life. It is as if, violence and death are the “only” order of things in the impoverished and oppressed communities living in the City of God (The Economist, 2003). The evolution of Li’l Dice, from an aspiring gangster 10 years of age to the cold-blooded, ruthless and ambitious leader of the pack is shown with cinematic excellence. But, the qualities mentioned above were not acquired by Li’l Dice as a result of his experiences. Instead, a taste of what to come in the future was to be seen during his very first participation in a Tender Trio operation. After the Tender Trio leave the looted motel with the money, the young Li’l Dice satiates his sinister longing to kill human beings by shooting the staff and clientele of the motel. This merciless and unnecessary killing of innocent people sets the theme for his subsequent adventures. But, as many critics have pointed out, it is difficult to fathom what the moral lessons from all these sequence of events. In defence of the director of the film, it is not his obligation to preach to his audience about what is right and wrong. On the other hand, making sense of the carnage induced by Li’l Dice and his accomplices remains a challenge to the audience. In this regard, it is difficult to conceive the movie’s contribution to positive social change (Publishers Weekly, 2006).